The broccoli retains its bite when cooked this way and the charred bits add an extra dimension of flavour. The season of the salad is here. Tired of the same old wilted ideas? Here’s a new gem from one of our favourite collaborators, Yuluishii, of Pretoria’s Off The Wall Pop-Up Restaurant in Hatfield. Heat a pan and add olive oil. When the pan is hot, add the thawed broccoli in small batches and char on the other side until nicely browned. Season with salt and pepper and set aside. To make the dressing, simmer the cream in a saucepan and crumble in the blue cheese. Stir thoroughly until cheese has melted and then add the thyme, salt and pepper. 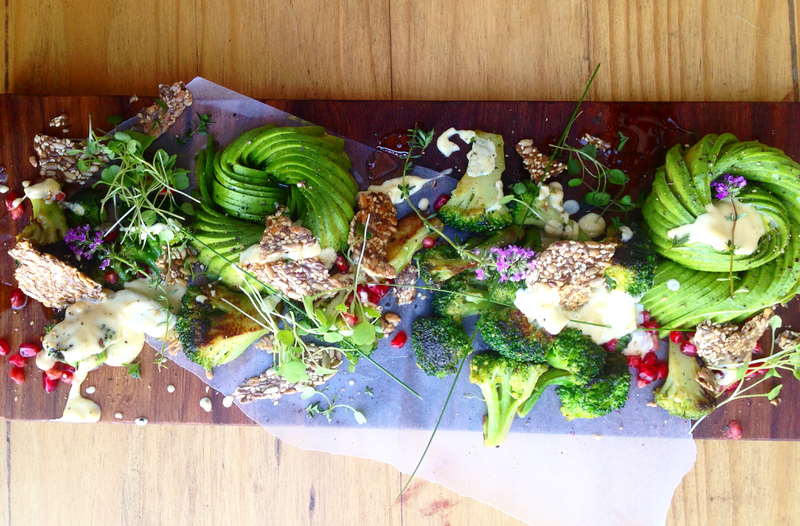 To assemble the salad, arrange the hot broccoli, sliced avocado and pomegranate on a platter and sprinkle with seeds. Pour over the dressing and garnish with fresh micro-herbs.